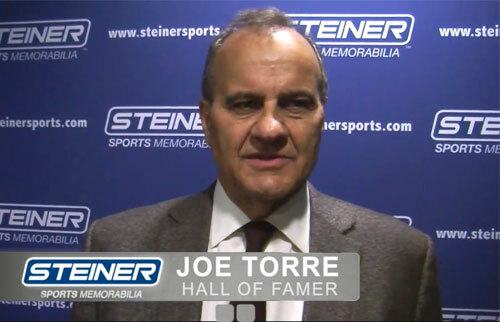 GARDEN CITY, N.Y. — Former Yankees manager and Hall of Famer, Joe Torre, will appear at Steiner Sports on Tuesday, May 26, 2015 to sign autographs and memorabilia for fans. The signing will be from 6:30 pm to 8:00 pm at the Steiner Sports Store located at Roosevelt Field Mall in Garden City, NY. For more info, click here. Torre is the former manager of the New York Yankees, St. Louis Cardinals & Los Angeles Dodgers. Torre was named manager of the Los Angeles Dodgers on November 1, 2007, but prior to the joining the Dodgers, he spent the past twelve seasons as manager of the New York Yankees. Torre is a sought after keynote speaker and has spoken for Fortune 500 companies across the country. He has also served as a spokesperson for many companies, including Chase, American General Financial Group, VISA, Amgen and Continental Airlines.